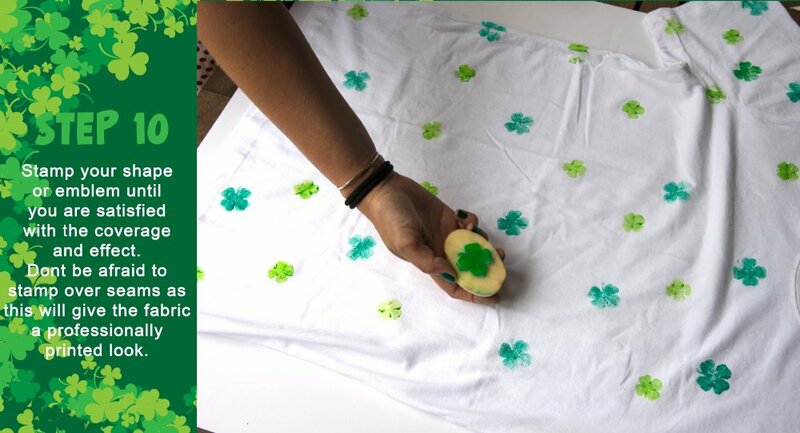 In this tutorial we show how to create a custom stamped shirt using Dala fabric paints and a potato stamp for St. Patricks day! 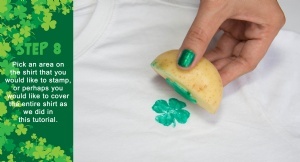 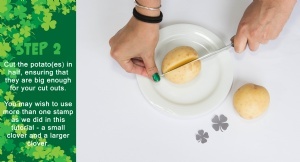 What could be more Irish than a custom St. Patrick's Day themed t-shirt made using a potato!? 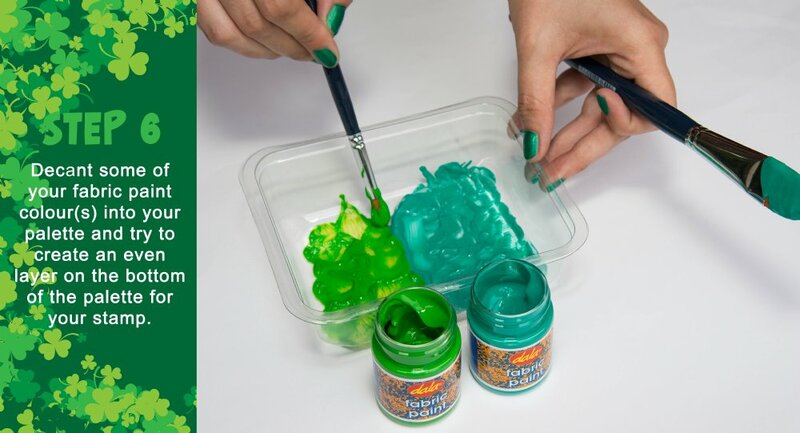 This method is loads of fun for kids too! parental supervision is advised when handling craft knives and scissors. 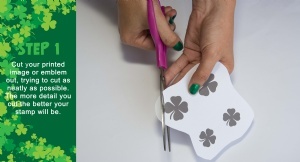 Cut your printed image or emblem out, trying to cut as neatly as possible. The more detail you cut the better your stamp will be. Cut the potato(es) in half, ensuring that they are big enough for your cut outs. 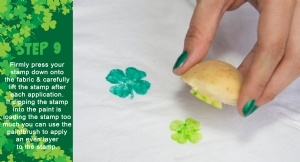 You may wish to use more than one stamp as we did in this tutorial - a small clover and a larger clover. 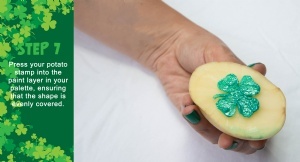 Gently place your cut outs onto the wet side of the potato(es) halves and press into place. 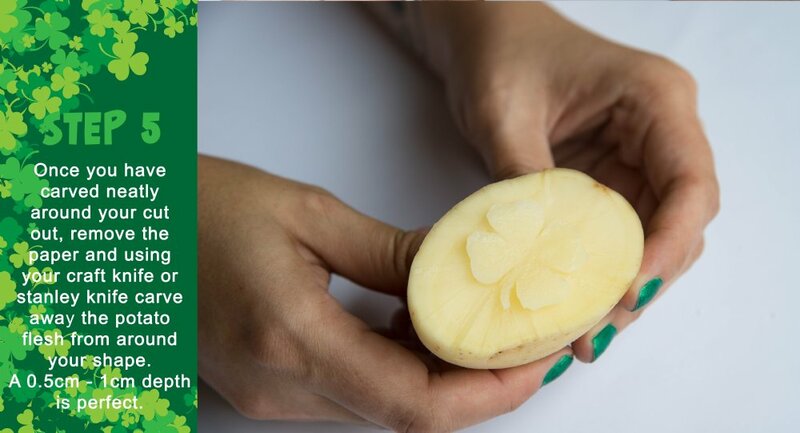 Using your craft knife or stanley knife, and using your paper cut out as a guide, begin to carve the shape into your potato. 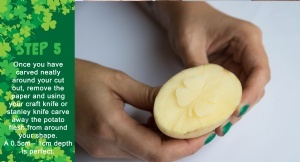 Use the knife at an upright angle to carve deeply around the shape. 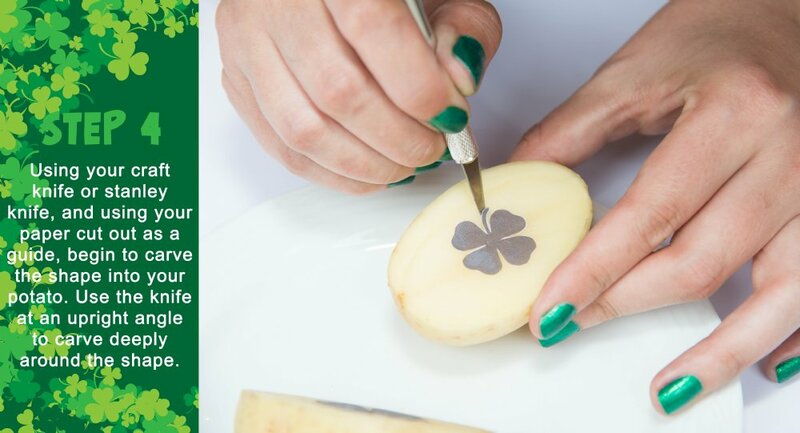 Once you have carved neatly around your cut out, remove the paper and using your craft knife or stanley knife carve away the potato flesh from around your shape. 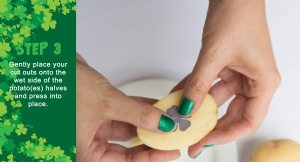 A 0.5cm - 1cm depth is perfect. 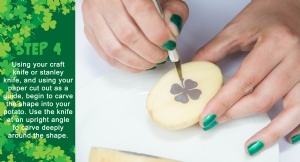 Press your potato stamp into the paint layer in your palette, ensuring that the shape is evenly covered. 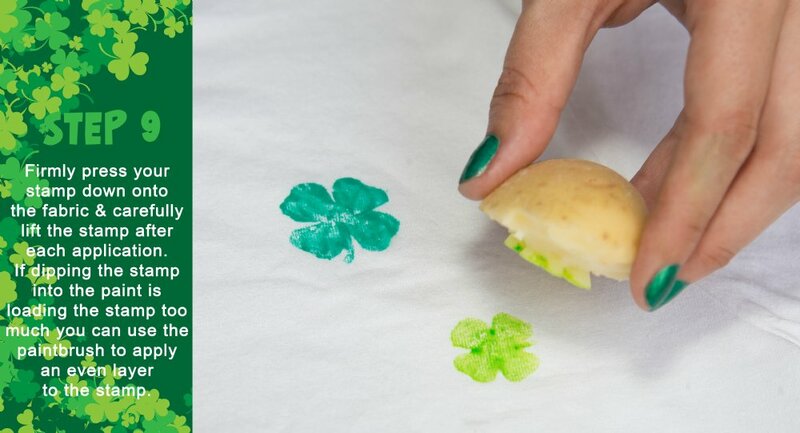 Decant some of your fabric paint colour(s) into your palette and try to create an even layer on the bottom of the palette for your stamp. Pick an area on the shirt that you would like to stamp,or perhaps you would like to cover the entire shirt as we did in this tutorial. Firmly press your stamp down onto the fabric & carefully lift the stamp after each application. If dipping the stamp into the paint is loading the stamp too much you can use the paintbrush to apply an even layer to the stamp. Stamp your shape or emblem until you are satisfied with the coverage and effect. 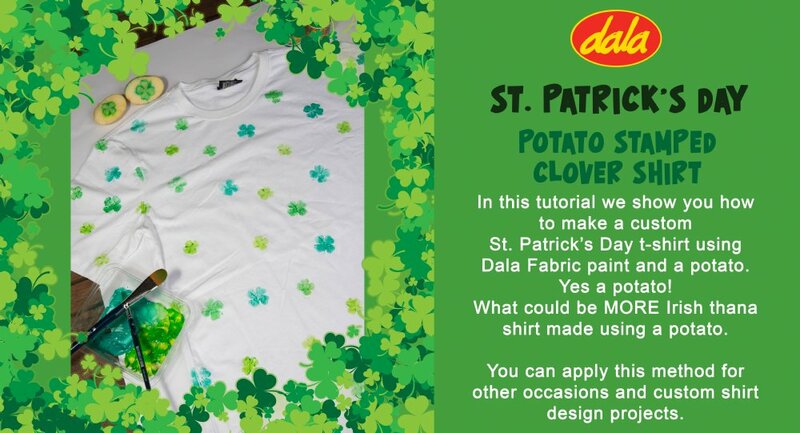 Dont be afraid to stamp over seams as this will give the fabric a professionally printed look. Leave your shirt to dry for about 20 mins and then heat seal with a low iron setting. 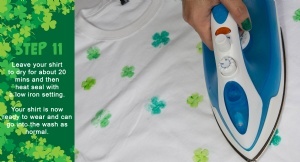 Your shirt is now ready to be worn and can go into the wash as normal. 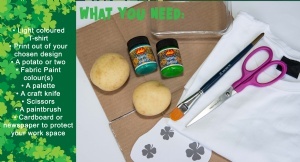 This item has 496 views.